← New Youtube Video: Should You Buy or Lease Solar? 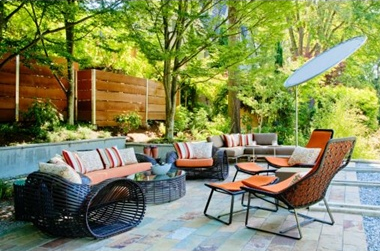 Now that the warmer months are on their way, your outdoor space is about to be the center of attention. Entertaining family and friends on your patio is one of the season’s greatest pleasures, and your eco-friendly lifestyle should be reflected in your outdoor spaces. Whether you’re trying to find ways to update your outdated furniture or you’re just looking to add color and texture, here are a few ways to stay Earth-friendly while giving your patio a makeover. Embrace natural fibers in vibrant shades. One of the easiest and most versatile ways to bring color to your outdoor garden furniture is by swapping out old cushions for new ones. Skip the synthetic fabrics and reach for organic cotton and durable hemp; both are naturally grown without the use of harsh chemicals and dyes. You can also find cushions that are filled with organically grown soy, corn, or cotton for a natural alternative to synthetic fiber-filled cushions. Try to keep your cushions out of the harsh sun and rainy weather to extend their life and to prevent colors from fading. Many outdoor furniture manufacturers offer eco-friendly cushions with natural dyes made from fruit and vegetable extracts to bring vibrant colors to your space. This entry was posted in Uncategorized and tagged backyard, patio furniture. Bookmark the permalink.